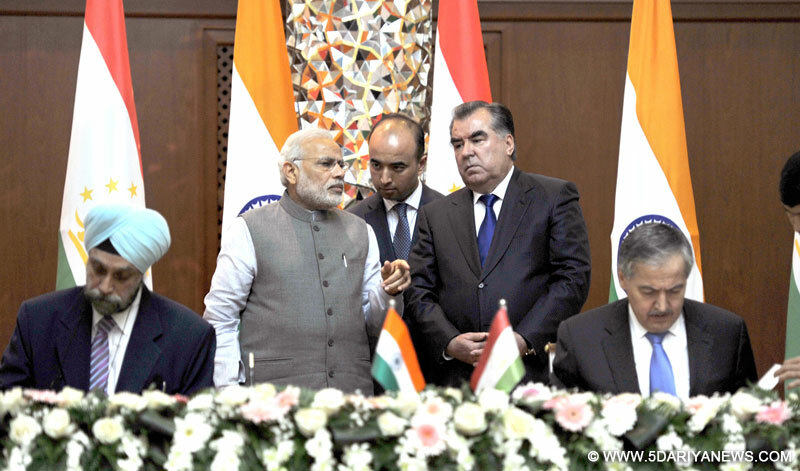 The Prime Minister, Shri Narendra Modi and the President of Tajikistan, Mr. Emomali Rahmon witnessing the signing of agreement, in Dushanbe, Tajikistan on July 13, 2015. India and Tajikistan on Monday inked agreements in the field of culture and human resource development after talks between Prime Minister Narendra Modi and Tajik President Emomali Rahmon here. "After delegation level talks, agreements were signed between India and Tajikistan in the field of culture and HRD," tweeted external affairs ministry spokesperson Vikas Swarup.Modi, who arrived here on Sunday night, held restricted and delegation level talks with President Rahmon at the Qasr-e-Millat.As part of the agreement, India is to set up computer labs in 37 schools in Tajikistan.